How to Grow Artichokes | Grow This! Artichokes are a perennial plant best known for their delicious, edible pine cone-like flower buds. They are relatively easy to cultivate and can be grown in a surprising number of regions. The most important trick is to grow artichokes in a method consistent with the climate in your area. Here are some tips on how to grow artichokes. Artichokes come in different varieties that can be more or less suitable to various growing conditions. Consult with local growers and choose a type that’s best for your area. You’ll need to choose between perennials and annuals, depending on whether you can sustain your plants year round. Note: perennials grown from seed may not produce heads in their first year. Annual varieties are best if you want heads the first year or live in a cooler climate where they cannot survive the winter. Artichokes need 90-100 frost free days to mature. They can be grown as perennials over the winter in growing zones 10 and 11. In cooler climates, they should be planted in the spring and grown over the summer. In some mild climates, they can be grown as perennials (usually zones 7 and warmer) provided you can keep them warm enough in the summer. They will not tolerate the heat of hotter climates. In growing zones 7 and colder, artichokes are best grown as summer annuals. They can be started indoors and transferred outside to ensure they have proper time to mature before the first autumn frost. Artichokes are best grown in areas with mild winters and moist (foggy), cool summers. For this reason, the central California coast is known for its abundant artichoke production. Otherwise, hardiness zones 7-11 are ideal, but they can be grown as annuals anywhere with enough days free from frost. If growing as a perennial, choose a space that you can dedicate to the artichokes for up to 5 years. Artichokes like full sun but can handle partial shade. Keep in mind, they can grow up to 5 feet tall and 3-4 feet wide, though annuals will usually not reach this size. Artichokes need to be planted in sandy loam or loose soil that drains well. The soil should be enriched with plenty of organic matter, like lots of mature compost before planting. Shoot for a neutral pH (6.5-7.5). 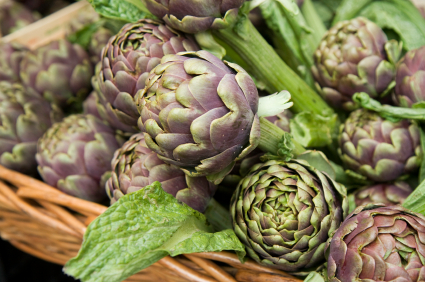 Artichokes can be grown from seed, from shoots of existing plants or from dormant roots. If you’re growing from seed, it’s a good idea to start them indoors, in individual 4″ containers about 8 weeks prior to the last frost of winter. Otherwise, follow sowing instructions on the seed packet for your particular variety. For most perennials, you will grow from starts but if you are starting from seed you’ll plant them like annuals in the spring. Transplant 8-10 inch seedlings outside once the danger of frost has passed. They should be about 8 weeks old. Seedlings should be spaced about 4 feet apart. In cooler zones (6 and higher), they can be spaced 2-3 feet apart since they will not reach their maximum size. Water regularly. Keep the soil moist but never muddy. Soggy roots will quickly thwart the growth and production of an artichoke plant. Mulch thickly and cultivate carefully to fight weeds. For perennials, use mulch to protect the plants from the colder parts of winter. Artichokes need regular feeding early on and again as they begin to develop buds. For best results, fertilize monthly with compost tea, fish emulsion or similar liquid organic fertilizer. Use a potassium-rich fertilizer to encourage bud formation during periods of rapid growth. Buds are ready for harvest when they are at least 3 inches in diameter (sometimes smaller if growing in too cool climates) and still firm and tight. They will lose their tenderness as they begin to open up. Once fully open, they will produce some beautiful purple flowers but will not be edible. The top buds will be the largest and first to mature. Cut them off as soon as they’re ready and let the lower buds finish. Once you have harvested every bud from one stem, cut the stem to ground level. If your plants are large, established perennials, you can prune them back by about a third to prepare them for the next season’s harvest. As the buds begin to form, try removing the mulch and adding a layer of compost around the base of each plant, about 12 inches outward. Watch out for slugs. Beer traps and pet chickens (or ducks!) help. Aphids, caterpillars and snails can also be a problem. In suitable year round climates you can produce 30 artichokes per plant per year. When gardening perennial artichokes, do not let any buds go to flower, which will weaken subsequent harvests.